Welcome to NAMIBIA-ECO-TOURS. Due to my studies in Namibia and interest in dryland ecology, I have known this exceptionally beautiful country for more than 20 years now. I invite you to an exclusive tour through Namibia. I invite you to forget time and space in the sheer endless vastness of Namibia. Discover fascinating natural phenomena including the Namib, the oldest desert in the world, the mysterious fairy circles and the diverse, occasionally bizarre varieties of flora and fauna that have evolved to survive in this ancient land threatened by constant drought. ECO-Tours stands for ECOLOGY, because the main focus of the journey will be on sharing information about the fascinating ecology of Namibia with you. I have known Namibia for over 20 years now – first by studying ecology and geography in Windhoek and then through research on savanna and desert ecology, including scientific publications on the fairy circles. With NAMIBIA-ECO-TOURS I would therefore like to share this knowledge and experience with you on selected tours. On your 12-day round trip you will learn about the latest findings on fairy circle research, natural wonders of the Namib and nature conservation in Namibia. Additionally there is a 4-day special tour to the fairy circles. Beyond exclusive information on desert ecology, NAMIBIA-ECO-TOURS also offers you ample opportunity to get to know this fascinating country and its welcoming people. You will stay in beautiful accommodation and enjoy great food, including local specialities. For the 12-day round trip, there are two differently priced options to choose between – the Tour “Deluxe” and the Tour “Comfort”. Group size is limited to eight people, ensuring a personal and customized experience that will maximize your enjoyment and learning. Tips on photography as well as great conversation under the starry evening sky are included. I look forward to sharing this amazing country and its ecology with you! At day 1 of your Namibia round trip you will visit the city center of Windhoek and the Daan Viljoen Game Park in the Khomas Highlands. On the second day of the tour we will drive from Windhoek to Wolwedans with its fairy circles in the Namib Desert. Wolwedans is one of the most exclusive destinations in Namibia. On the third day of our journey, we will drive through the dune landscape of the NamibRand Nature Reserve and explore the fairy circles. Today, we will drive from Wolwedans towards the area near Sossusvlei and you will have the chance to visit the Sesriem Canyon and the Elim Dune. Day 5 of the tour will take you to Sossusvlei and Deadvlei, where you will get to see unforgettable photo scenes in the morning light. Day 6 of your tour will take you through the Kuiseb Canyon and Namib-Naukluft National Park to Swakopmund. Halfway through the 12-day round trip, we will visit the Moon Landscape and Welwitschia plants in the Namib and you will have plenty of time for a sightseeing tour in Swakopmund. On day 8 of the tour we leave the flat plains of the Namib Desert and drive to the hilly Damaraland, which is characterized by striking mountains and granite rocks like the Spitzkoppe. Today you will get to know the surroundings of Twyfelfontein with its granite outcrops. You will experience the typical Damaraland with its wildlife and picturesque table mountains. 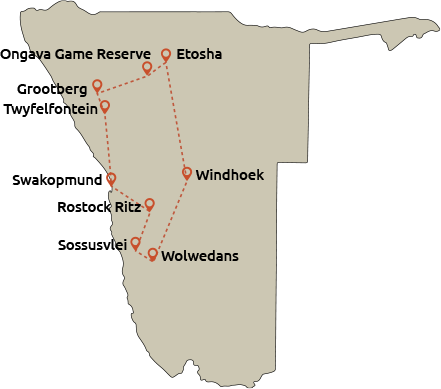 On day 10 of the tour we leave the western part of Namibia and drive eastwards to the Ongava Game Reserve, which is located near the gate of Etosha National Park. On the second last day of your tour, you will once again experience an absolute safari highlight. We will spend the whole day watching game in the world famous Etosha National Park. Unfortunately, the tour ends today. But you will get to see Namibia's wildlife again in the morning on a safari before heading back to Windhoek. Namibia is an ideal travel destination for an unforgettable holiday in Africa. I would like to give you the 10 most important reasons why you should have experienced Namibia. 1) With about 300 days of sunshine a year, the weather is very predictable and you can be sure that you will return home tanned. Rainfall events during the season from February to April are by no means “bad weather”. Rather, they reveal how dynamically life and landscape changes within a short period of time, because for humans, animals and plants, the precious water is a pure event of joy. 2) Due to the few clouds and the dry desert climate, the warm air rises quickly in the evening and the nights have relatively pleasant temperatures for a restful sleep. 3) The clear cloudless sky without urban light pollution allows a unique view of the starry sky. Namibia holidaymakers are always thrilled how many stars you can see at night. 4) Namibia is the land of vast expanses and therefore offers a maximum contrast to the usual city life. Here the visitor can really relax and enjoy being alone with himself and nature. 5) With a rainfall spectrum of practically 0 to over 600 mm annual precipitation, the country offers a wide variety of habitats – from the desert to sub-human regions in the Caprivi Strip. 6) As a land of contrasts, Namibia is exceptionally exciting – high daytime temperatures vs. cool nights, hostile drought vs. life-affirming bizarre adaptations of animal and plant species, modern capital vs. traditional rural lifestyles – the list could be extended by much more. 7) In times of international crises and crime, Namibia is a relatively safe and politically stable travel destination. 8) Namibia offers high travel comfort – there are first-class hotels and lodges, excellent food and well paved roads and even the gravel roads are regularly smoothed and mostly in good condition. 9) Namibia does not require any special vaccinations or health care because the dry country is predominantly free of pathogens such as malaria, sleeping sickness, bilharzia and similar pathogens. You can take malaria prophylaxis for visiting Etosha Park, but the risk of getting malaria is low. In addition, there is very good medical care, well-equipped pharmacies, a flying rescue service and a functioning mobile phone network, also outside the cities. 10) Last but not least, Namibia offers unique natural wonders such as the mysterious fairy circles, Welwitschias or Onymacris plana, one of the world’s fastest running beetles. Area: Namibia covers 824,292 km² (318,259 mi²). Location: Situated on the southwestern coast of Africa, Namibia borders Angola and Zambia in the north, South Africa in the south and Botswana in the east. Literacy: The current literacy rate in Namibia is about 83 %, one of the highest in Africa. Religion: Freedom of religion was adopted through Namibia’s Bill of Fundamental Rights. About 90 % of the population is Christian. Currency: The Namibia Dollar (N$); the Namibia Dollar and South African Rand are the only legal tender in Namibia and can be used freely to purchase goods and services. Time Zones: Summer time: GMT + 2 hours from the 1st Sunday in September to the 1st Sunday in April. Winter time: GMT + 1 hour from the 1st Sunday in April to the 1st Sunday in September. Electricity: 220 V AC, 50 Hz. Outlets are of the round three-pin type D or M.